Posted on August 17, 2016 by T.E.G. 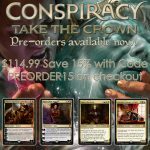 Coming soon to a TEG near you, Conspiracy 2.0 (aka Take the Crown) Get yours while supplies last! Click below for special Pre-order pricing with the code PREORDER15 at checkout. Release date of Friday, August 26th. Posted on May 11, 2016 by T.E.G. Oath of the Gatewatch post-launch review!